WMAP Five-year Paper Figures, Gold, et al. Comparison maps of the five-year masks versus the three-year masks. The new masks cover slightly more of the galactic plane and cover more regions with low synchrotron but high free-free emission. The diamond-shaped features arise because the new processing mask has been defined to correspond to low-resolution (Nside=16) pixels, so that the same processing mask can be used at all resolutions. A slice in parameter space of the surface nulled by the ILC coefficients, assuming a three-component foreground model with power-law spectral behavior, T(ν) = Tsνβs + Tƒν2.14 + Tdνβd . Each line is for a single ILC region, denoted by number. The parameter space is Tƒ/Ts, Td/Ts, βs, βd. For this plot the x-axis is βs and the y-axis is Td/Ts. The parameters Tƒ/Ts and βd are fixed at 0.7 and 1.8, respectively. Each color is a different ILC region. 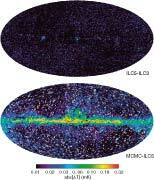 Despite the variety amongst ILC coefficients, they often null similar regions of parameter space. Comparison of MEM foreground modeling results from the WMAP three-year and fiveyear analyses. 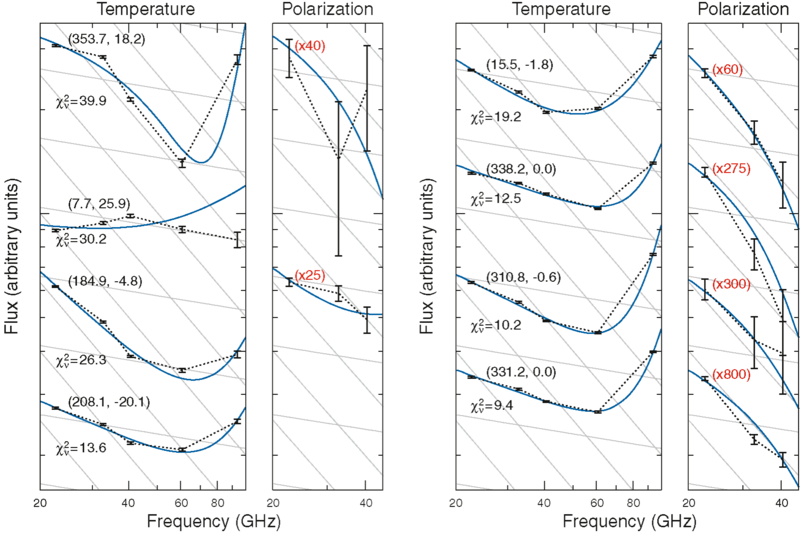 The first three panels show latitude profiles of antenna temperature for the individual foreground model components. The last panel compares the observed foreground emission spectrum (diamonds) with spectra of the total MEM model and the individual model components (line segments between WMAP frequencies), averaged over 20° < |b| < 30°. 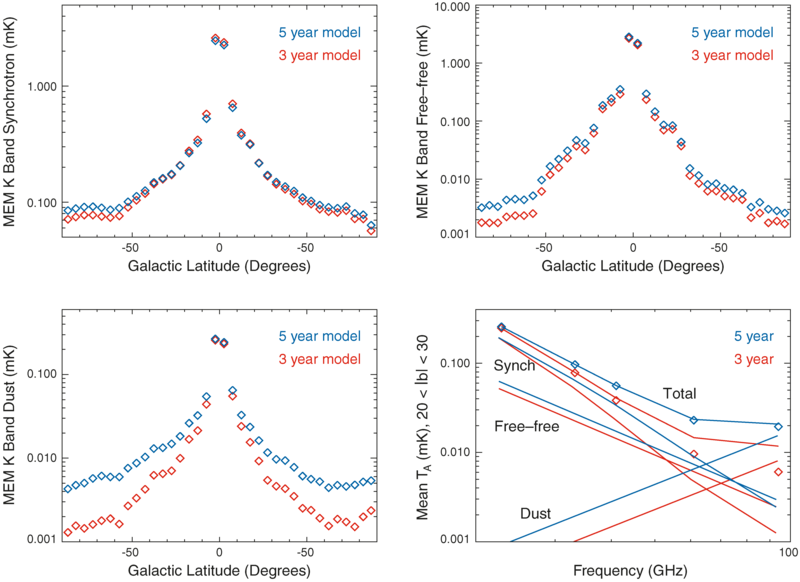 The differences between the three-year and five-year model results are mainly due to differences in zero levels between the three-year and five-year maps (see text). The mean model brightness exceeds the mean observed brightness at the higher frequencies because the observed brightness is negative for some pixels and the model is constrained to be positive for each pixel. This is less apparent in the five-year results because there are fewer negative pixels. 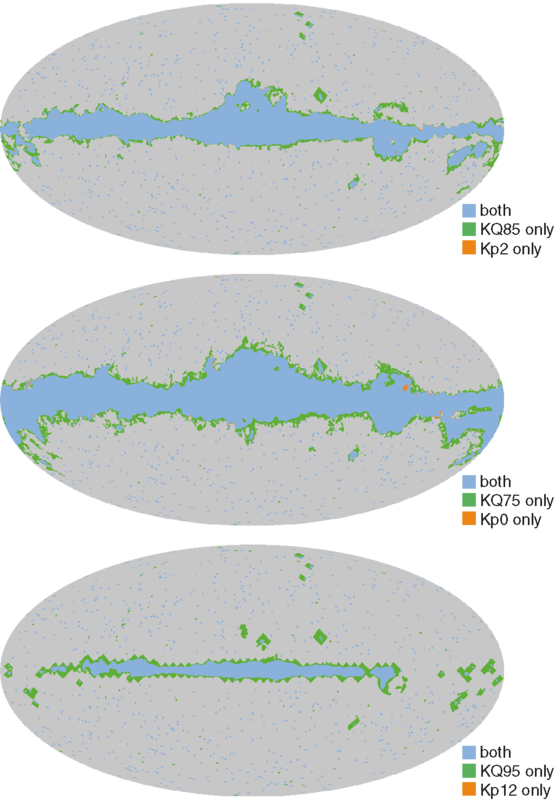 Five-year temperature maps with foregrounds removed via template cleaning. All maps have had the five-year ILC estimate for the CMB subtracted, and have been degraded to Nside = 32. Frequency bands shown are Q, V, and W. Compare to Figure 10 of Hinshaw et al. (2007). 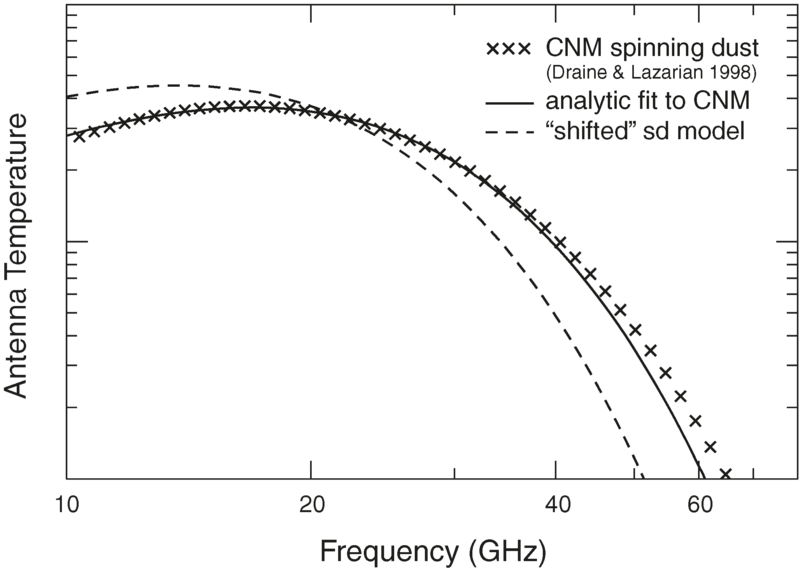 The exact cold neutral medium (CNM) spinning dust spectrum as calculated by Draine & Lazarian (1998), an analytic fit to the model, and the ad hoc “shifted” model which better fits radio observations in the Galactic plane. The shifted model may represent a mix of warm neutral medium and warm ionized medium models, or another emission process entirely. The vertical axis is in units of antenna temperature, but the overall scale is arbitrary. Agreement between the exact model and the analytic approximation is better than 5% over the frequency range from 15 to 35 GHz. This is smaller than the fractional error from fits that include a spinning dust component. 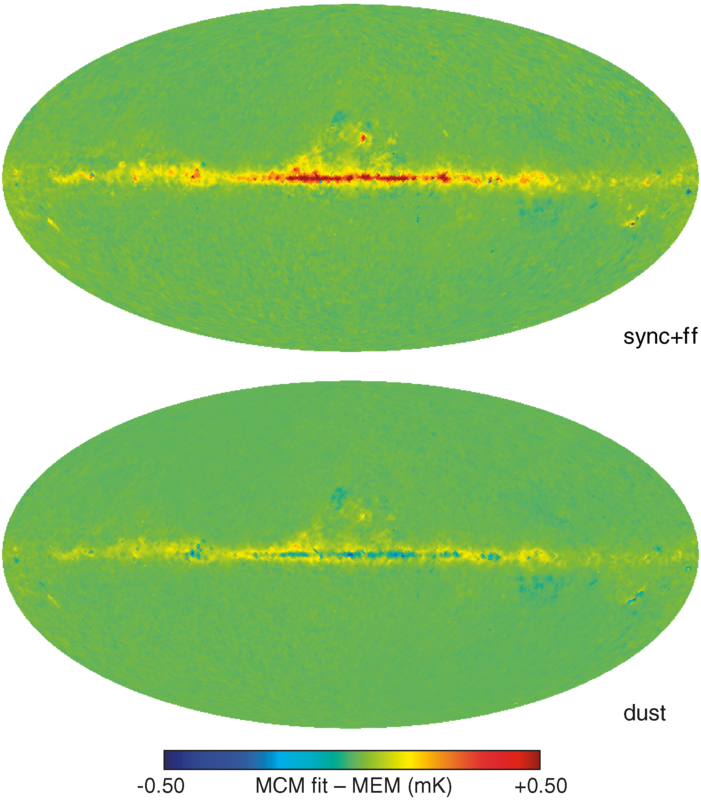 Difference maps between input and output foregrounds for the mock sky reconstruction. For comparison, the peak temperature for synchrotron plus free-free inputs was 17 mK, and for the input dust the peak was 1.9 mK. The degeneracy between synchrotron and free-free emission means their sum is much better constrained than either component individually. 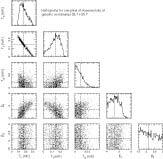 The scatter is larger than the bias, which is small compared to the input signal and within the error estimate given by the fit. These degeneracy issues are also illustrated in Figure 7. Synchrotron and free-free antenna temperatures are defined as measured at K-band, and dust as measured at W-band. Histograms for foreground parameters for a single pixel of mock sky reconstruction. The mock foregrounds were designed to have the same basic behavior as the true sky but do not match in detail. The same pixel is examined for the true sky in Figure 8. Dashed lines indicate the mean of the chain, crosses indicate the best-fit point, and stars indicate the input values for the parameters. The strong Ts–Tƒ degeneracy and the curved Ts–βs degeneracy are typical for high signal-to-noise pixels. 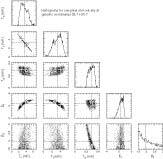 Other parameter correlations are minor. Both the mean and best-fit parameters of the chain are within the expected error range from the input values. Histograms for foreground parameters for a single pixel of the observed sky from actual WMAP data, not simulation. Dashed lines indicate the mean of the chain, and crosses indicate the best-fit point. The observed sky shows the same basic behavior as the simulated sky used for testing. Residuals of the “base” model foreground fit subtracted from the data. The left column shows the residuals in units of noise sigma, from -6 to 6. The right column has the 85% mask applied and a scale of -3 to 3. 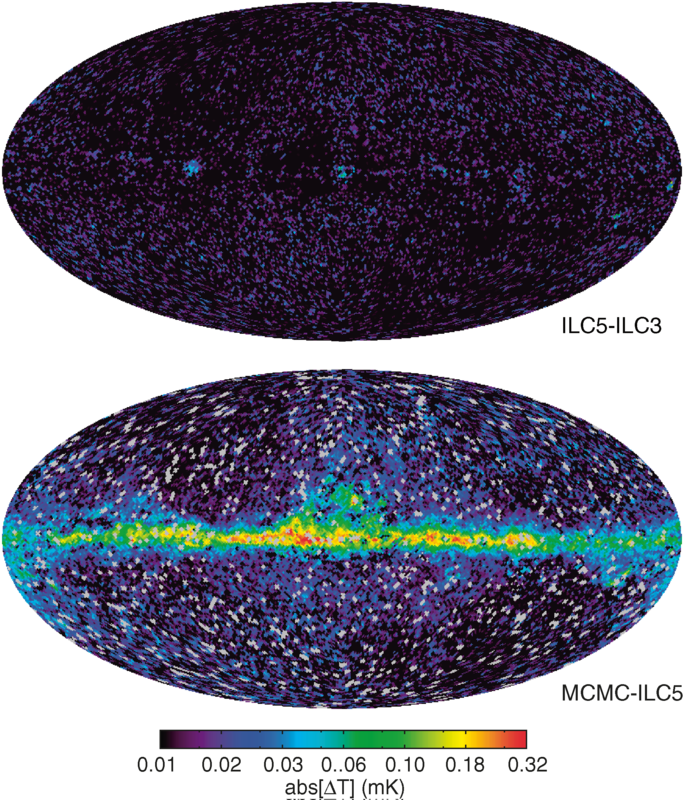 Frequency bands are (from top to bottom) K, Ka, Q, V, W. The main feature is that the model underestimates Galactic flux in Ka band and overestimates it in Q band by a factor of 3 to 5 times the pixel noise. Outside the analysis mask the residuals to the model are consistent with noise at the expected level. Difference between the MCMC fit and MEM maps. The top panel is the difference (at K band) in synchrotron plus free-free emission. Differences between these two components separately are larger due to the degeneracy direction. 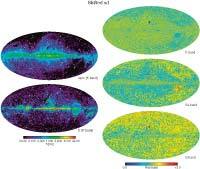 The bottom panel is the difference (at W band) in the dust maps. The differences are roughly one percent of total emission at K band and a few percent at W band. Error maps for foreground components as determined from the marginalized variance given by the MCMC fitting process. Error maps for synchrotron and free-free emission are similar due to the parameter degeneracy between them. 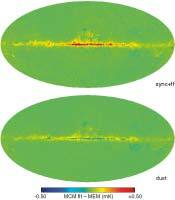 Synchrotron and free-free temperatures are as measured at K-band, dust is measured at W-band. Gray pixels are those masked due to point sources or flagged as problematic. Top – synchrotron; middle – free-free; bottom – dust. Map of synchrotron spectral index for the “base” fit, binned to Nside = 16. Color shows the value of the spectral index, and circle area indicates the weight σβ-2 given by the fit. Pixels with Χ2ν > 2 were explicitly de-weighted. Map of the reduced Χ2 per pixel achieved by the “base” fit. Except for a slight excess of high Χ2 values from the plane, the overall statistical distribution is that of an ideal Χ2 distribution. 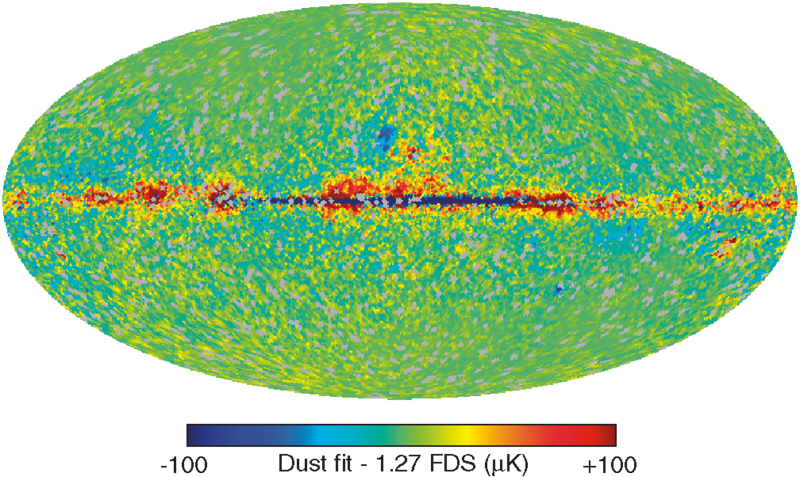 Residuals between the best-fit dust map from the “base” model and 1.27 times the “model 8” dust map of Finkbeiner et al. 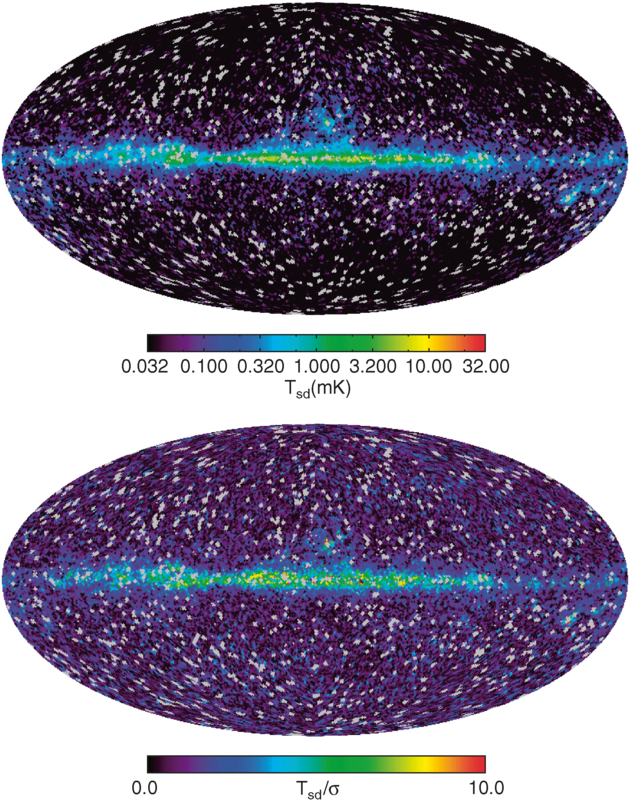 (1999) extrapolated to 94 GHz. Pixels with Χ2ν > 5 or covered by the point source mask are colored gray. The MCMC fit prefers less dust emission directly toward the Galactic center (deep blue pixels), and somewhat more emission further away (red and orange pixels). Units are antenna temperature at 94 GHz. Synchrotron index plotted as a function of latitude for several fits. Pixels are binned by latitude, and only longitudes between 350 and 10 degrees are included. Error regions indicate the 68% scatter within each bin. Solid black squares (gray region) are for the “base” model, blue crosses (blue region) are for the “base” model with 408 MHz data, and red empty squares (red region) are for a fit using only WMAP’s polarization data. Fits where the dust spectral index was fixed to 1.7 and 2.0 are almost identical to the “base” fit. 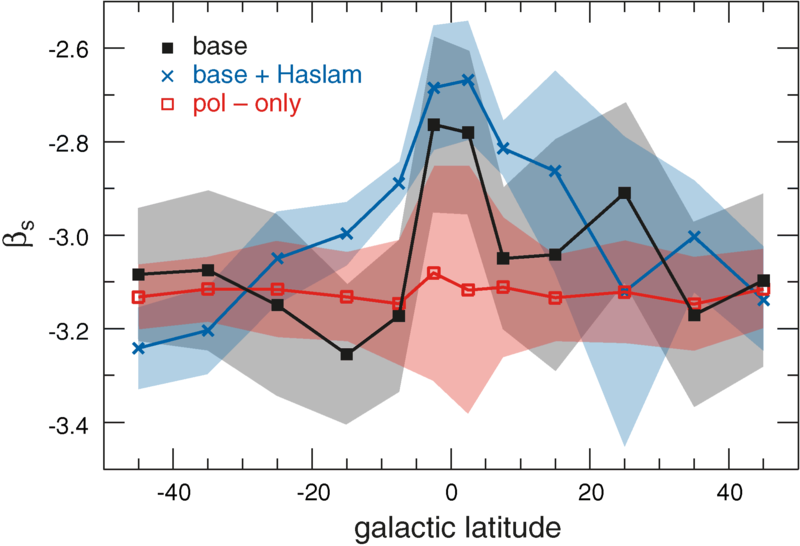 The trend to flatter spectral index in the plane does not appear when only polarization data are used, but the signal-to-noise is not high enough for the discrepancy to be significant. 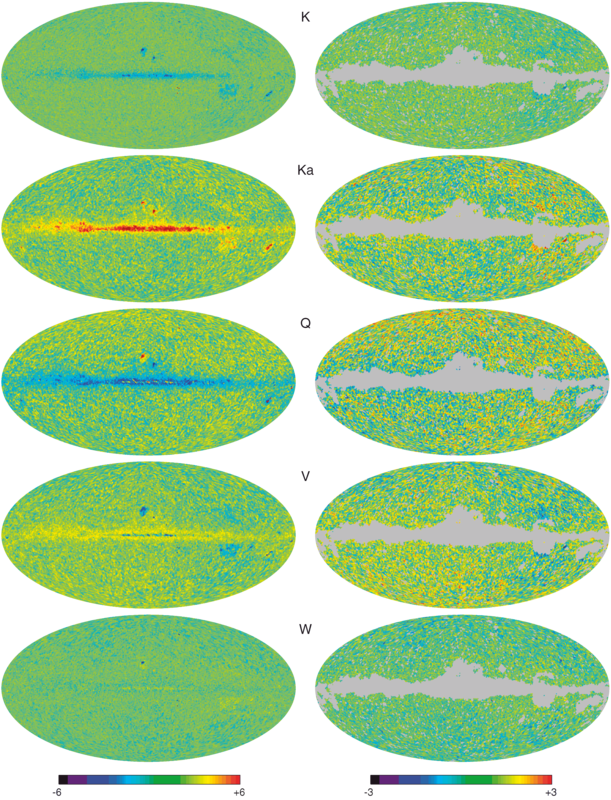 Temperature (Stokes I) and polarization (√Q2 + U2) spectra for poorly fit pixels in different regions of the sky. The vertical scale is arbitrary flux units, but polarization data is shown beside the corresponding temperature data with a number in red indicating the approximate (Kband) ratio of intensity to polarization. Polarization data is not shown for pixels with low signal to noise. 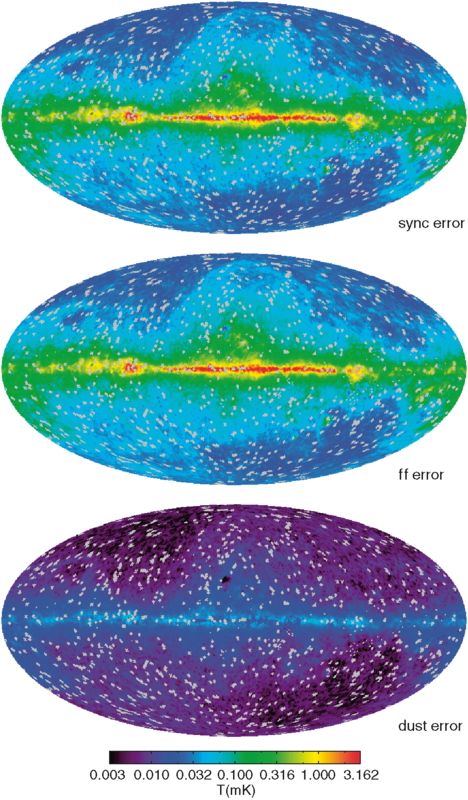 Numbers in parentheses are Galactic coordinates. The blue curve is the best-fit “base” model. The model does not include synchrotron steepening; convex slopes are due to negative CMB contributions. The grid of gray lines indicates spectral indexes of α = -0.14 and α = -1. The left plot shows pixels further from the plane; the right plot shows pixels near the plane. The fit converged for all regions shown and none were covered by the point source mask. 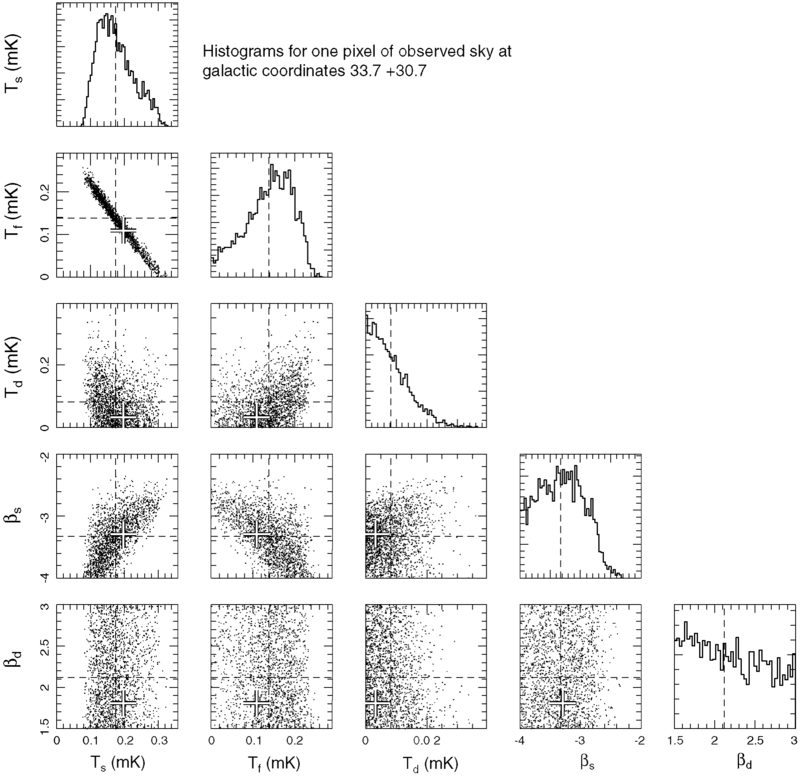 However, the four pixels shown on the left are (from top to bottom) within a few degrees of ρ Oph, ζ Oph, Tau A, and the Orion nebula. 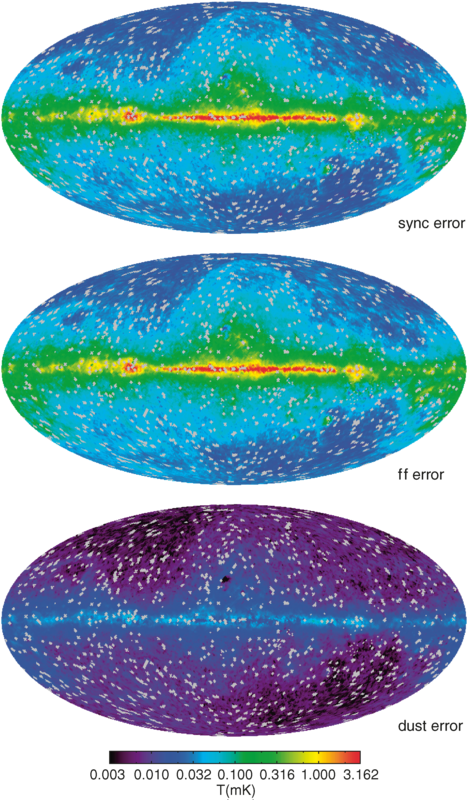 Maps for foreground components as determined by the MCMC fitting process for the “steep” model. This model has a frequency dependent synchrotron spectral index βs(ν) = βs + c ln(ν/νK). 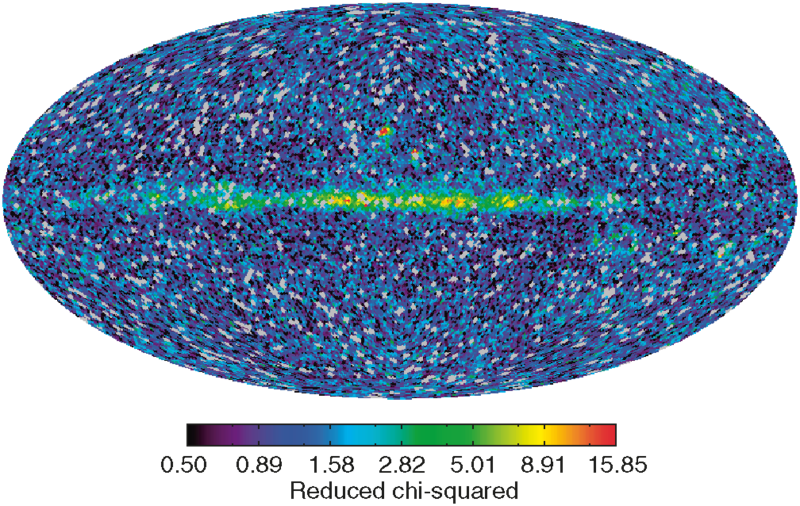 Synchrotron and free-free temperatures are measured at K-band, and gray pixels are those masked due to point sources or flagged as problematic. Since this model does not differ from the “base” model at high frequencies the thermal dust emission is unaffected and is not shown. 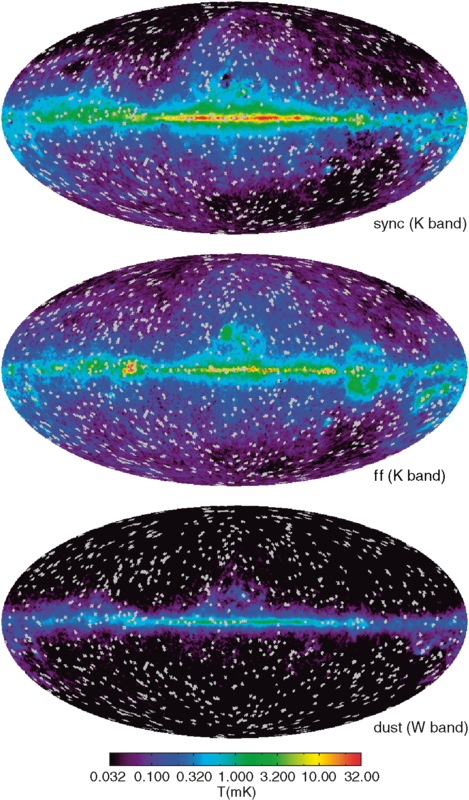 Note that the steepening parameter tends toward large negative values in the galactic plane. Top – synchrotron; middle – free-free; bottom – steepening parameter c.
Foreground components and residual maps as determined by the MCMC fitting process for the “shifted sd” model. This model adds a spinning dust component at low frequencies where the peak emission frequency has been lowered to better match the data. Synchrotron and free-free temperatures are measured at K-band, and gray pixels are those masked due to point sources or flagged as problematic. The spinning dust component is shown in Figure 20. This model also does not differ from the “base” model at high frequencies and thus the thermal dust emission is unaffected and not shown here. Left – synchrotron and free-free maps; right – residuals (in dimensionless units of noise sigma) to the fit at K, Ka, and Q-bands. 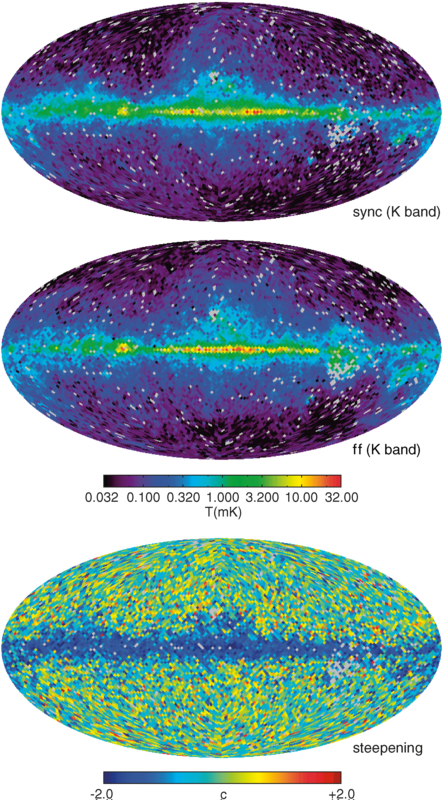 Top: Map of spinning dust antenna temperature Tsd (as measured at K-band) for the “shifted” spinning dust model fit. 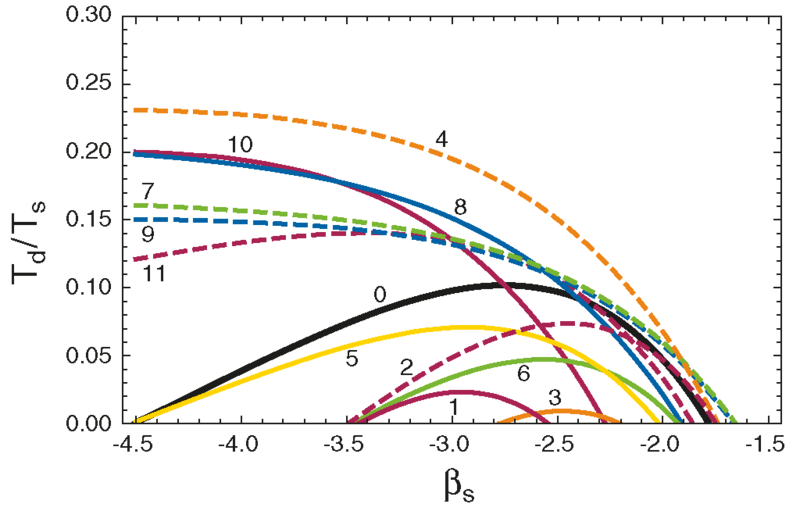 While the model is based on a spinning dust spectrum, the data are insufficient for distinguishing the physical emission mechanism from other possibilities mentioned in the text. 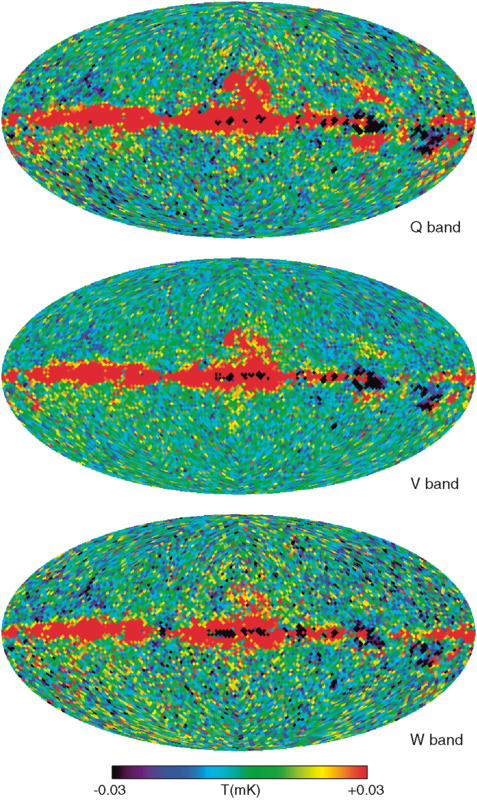 Maps of the other three foregrounds are qualitatively similar to that of the “base” model, with the synchrotron amplitude reduced to accommodate the additional low-frequency component. 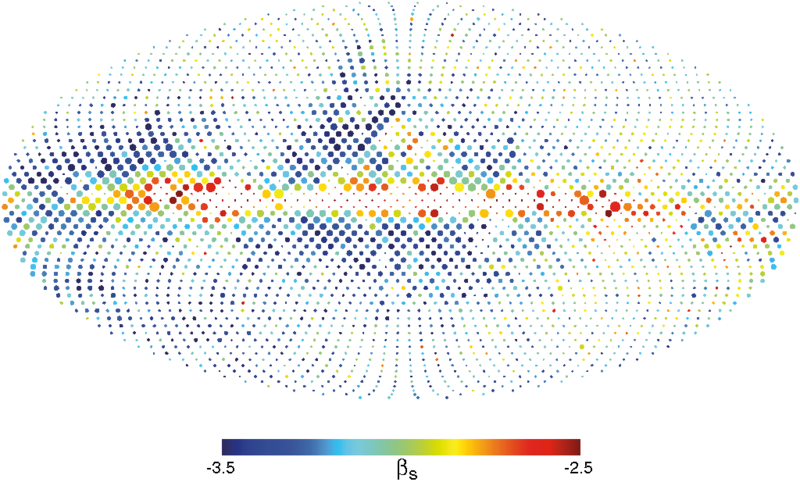 Bottom: Map of spinning dust temperature divided by the marginalized temperature error as calculated by the MCMC chain. This is statistical error only and does not include uncertainties in the model. 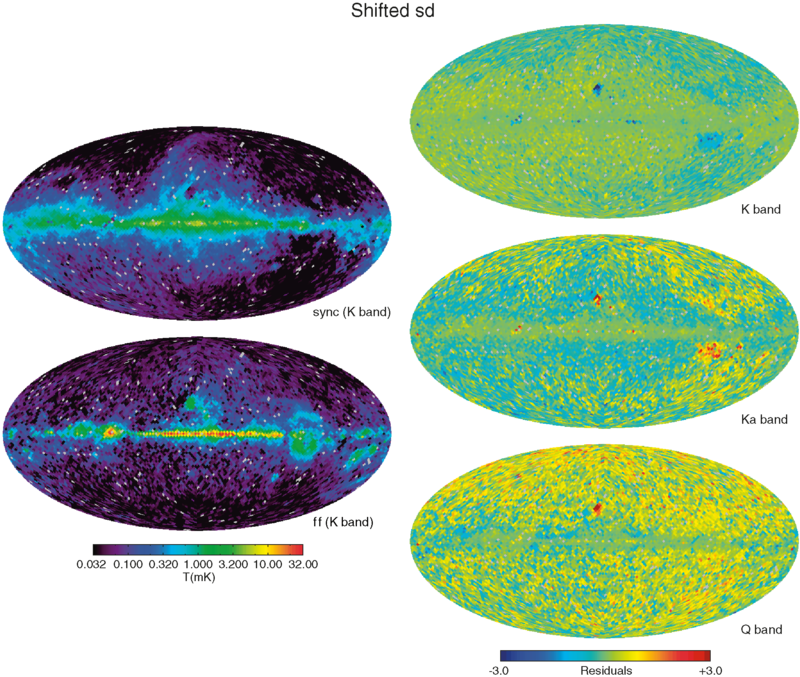 Difference maps between the five-year and three-year ILC maps (top), and the MCMC fit for the CMB and the 5-year ILC map (bottom). Even for the latter, the variance outside the KQ85 analysis mask is 116 μK2, lower than the primordial CMB power.